SS Friday Sep 18th. Otp Tuesday Sept 22nd 6pm. Huge lot conservatively listed at 1.5 acres with many mature trees and a beautiful view. Upgrades include: Shingles (2009), Hotwater tank (08), Automatic Garage Door (08), Airconditioner (03), Water Softener (03), Furnace (01), Some Plumbing (01). All the "boring" upgrades are done, just needs some decor updating. This is reflected in the modest price. Unique and handy layout perfect for entertaining or a growing family. 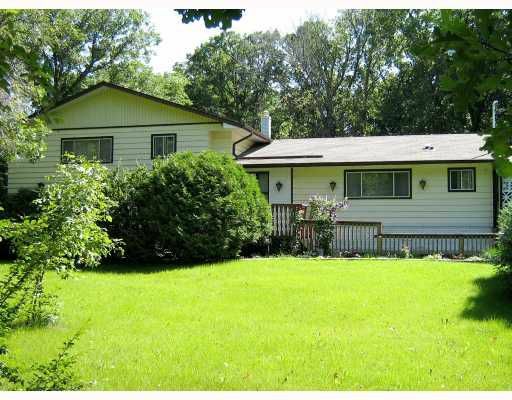 Serene Country lot is close to city limits and not too far to drive anywhere. Huge back yard is alreay fenced in ($15k cost). Perfect for dog owners or gardeners. Large double garage (220Volt Vendor Believes)and driveway great for car lovers. Second Floor toilet does not work. Appliances are included in 'as is' condition. Municipal plans exist for the installation of a common sewer line under Henderson Hwy in future.